The Canal District in Montreal forms the setting for Myst Condos, the modern new residence that is the brainchild of developer Fadi Melki. This unique residential opportunity is a vision born from the location he chose 17 years ago for his carpet factory. One day while walking along the shaded shore path by the water, it dawned on him that the property would be ideal as a place to live. And he was right. With a backdrop of trees and water, Myst Condos is literally next door to the Atwater Market on the Canal’s southern shore, only a few minutes from downtown. The Canal District is also home to antique shops, award-winning restaurants, entertainment venues, art galleries and more – all in this laid-back cosmopolitan area. 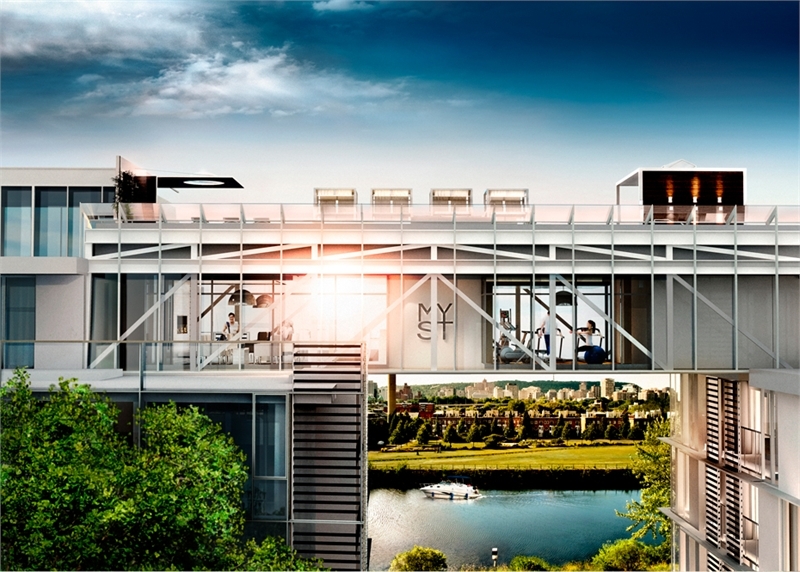 Setting a new standard for contemporary luxury, Myst Condos will offer 145 residences in a building with a six-storey cutting-edge exterior by Atelier Chaloub + Beaulieu Architects. You simply have to see the renderings of the 5-Star resort amenities that will be part of the everyday life of suite owners. From the crisp, clean lobby with it sleek modern bar to a gym infused with natural light from floor-to-ceiling windows, the common areas in this condominium are anything but common! Plus, the design features a fabulous rooftop pool and sundeck with THE chicest cabanas in the city. Massive windows also characterize the sophisticated open-concept suites, which are adorned with luxe features and finishes. Sizes range from a 648 one-bedroom layout to a 2,344 sq. ft. three-bedroom penthouse. Can you believe these suites begin in price from just $249,900? The Presentation Centre is now open at 2365 St-Patrick. For more information, call 514-947-6978 or register atwww.mystsurlecanal.com or www.baker-re.com.